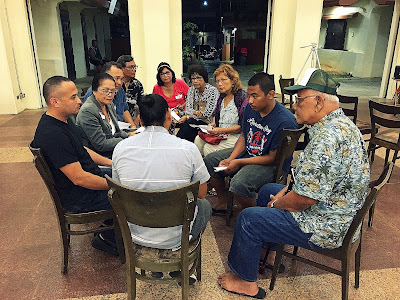 Six years ago under the guidance of Peter Onedera, the Chamorro language program at UOG held a Chamorro Language Forum, in which senatorial and gubernatorial candidates were asked questions in Chamorro about pertinent island issues. It was on one hand a great success. Students asked hundreds of questions to the candidates in the Chamorro language. But on the other hand, the format of the forum made it so that candidates didn't have to speak in Chamorro, they could just respond in English. 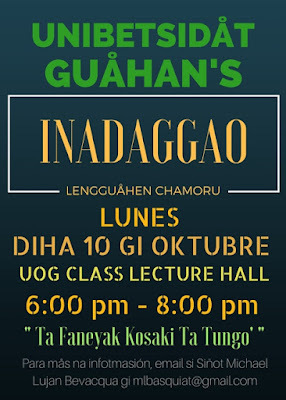 I assisted Peter Onedera with these forums both as a student and a professor at UOG, and so I found it on the one hand inspiring to see a place where the Chamorro language was the focus for political discourse. But it was also so depressing to see so many leaders and would-be leaders not even trying to speak Chamorro, even though they were given the questions ahead of time and could have prepared answers. Esta hu sangani hamyo na gof ya-hu i bidada-na si Steven Benen. Kada diha ha na'huhuyong meggai na tinige' put hafa masusesedi gi botasion Amerikånu para presidente. Fihu gof tinanane' yu' guini giya Guahan, ya mappot para bei taitai todu ya tattiyi todu gi sanlagu. Lao sesso inayuda yu' as Steve Bene. Estague noskuantos na tinige'-na ginen pa'go ha' na diha. The Independence for Guahan Task Force held their second monthly general meeting last week and it was a significant success, with 70 members of the community coming to listen to educational presentations and provide feedback. 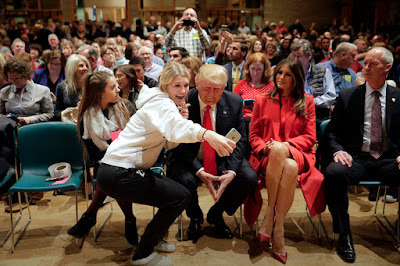 Here are some media reports on the meeting, both before and after. As you'll read below the educational portion of the evening focused first on security threats to Guam due to it being a strategically important unincorporated territory of the United States. Second, it contained a presentation on Singapore, the first model of an independent nation that Guam can look to in terms of inspiration as it pursues independence itself. 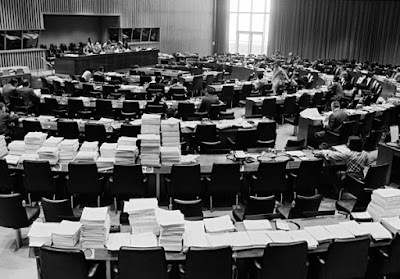 Each monthly meeting will feature a new independent nation to analyze and compare. Does the US military turn Guam into a regional target? Todu i Chamorro siha ni' mañathinanasso put i kotturå-ta yan i minalingu i lenguahi-ta, debi di u ma tatai este. Anggen ta cho'gue mas kinu manggongongong siña ta na'lå'la' mo'na i lenguahi-ta. Atan este na familia. Manu na gaige i Chamorro siha ni' siña tumattiyi este na hemplo? Like many parents, Nancy Mike and Andrew Morrison have to work hard if they want to preserve their aboriginal language. 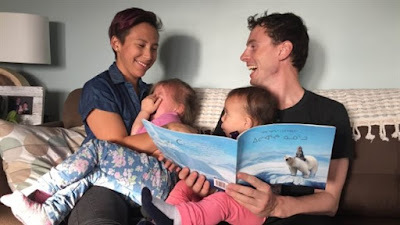 Because so much English is spoken in Iqaluit in the northern territory of Nunavut, they have decided to ban English at home and oblige their two daughters to speak their native language of Inuktitut, reports CBC. Democracy Now! is doing some great coverage of the protests over the North Dakota Access Pipeline in North Dakota. Here are some interviews and a column from Amy Goodman after a warrant was put out for her arrest in response to her coverage. If you are able, please consider donating in order to support their continuing efforts.